On Kurt Vile’s guitar epic “Bassackwards,” a highlight from the Philadelphia singer/songwriter’s newly released seventh album Bottle It In, Vile sings about “chilling out/but with a very drifting mind.” That “drifting mind” is an illustration of Vile’s particular duende. In conversation, as in his songs, he slides from place to place, idea to idea. He does so easily and without much stress. Recently, while in town for a brief press tour, Vile stopped by Aquarium Drunkard HQ to sit down with Justin Gage to discuss the record, recording with Dean Ween of Ween, the influence of Sonic Youth, working with Kim Gordon, and how collaborating with his “sister” Courtney Barnett helped shape the new album. Aquarium Drunkard: So how long have you been in LA? Kurt Vile: One and a half days. AD: How do you like being on the West Coast? Kurt Vile: I actually like it here a lot, I like recording here. I have a lot of friends here I like to record with. One of my old friends from Philly…Mary Lattimore, moved out here. I play with her a lot. But also Stella Mozgawa from Warpaint…I’m friends with all those girls. They’ve all been involved at some point, but [it’s] mainly Stella I love to play with. Farmer Dave Scher from the Beachwood Sparks, and his great solo things. There are all kinds of people here I like to play with and record with. AD: Speaking of that, Bottle It In was recorded, at least in part, out here in LA, right? Kurt Vile: Yeah, that’s definitely a key part…People like Rob Schnapf, he’s my good buddy since the last record, b’lieve i’m doin down…he kind of rescued part of my record. We were doing it on our own and he saved us in the nick of time. He recorded “Pretty Pimpin’.” I went in…and was like, “I have this new song, maybe we should start with that.” And it turned out to be “Pretty Pimpin’,” which if I had a hit, it would be that song. I got used to working with Rob Schnapf for sure, so he was involved in this record. Also on the East Coast, Peter Katis recorded some. AD: Yeah you guys recorded this record all over. Where else in Los Angeles? Were you out on the west side? Kurt Vile: That was in downtown LA, where Sean Everett is. Yeah, that’s a whole different ballgame downtown. He’s a maniac, too. Everybody has a different style, you know. AD: In terms of that, did you feel like that process worked for you? Recording all over versus kind of hunkering down in one spot? Kurt Vile: Yeah I think I like to have a few different perspectives. I would like to have different dimensions. I like the idea of just working with one person too, but I’m just not at a point where I know who that’s going to be. AD: We caught up and interviewed Dean Ween last year, and he mentioned recording some stuff with you. Kurt Vile: These past few years have been [filled with] lots of sessions. I recorded in Nashville with this kind of legendary dude, David Ferguson, they call him Ferg, [and he’s] Cowboy Jack Clement’s engineer. [And] this past winter I have been recording at Dean Ween’s house, or his shed or studio. We recorded a handful of songs already and I was kind of bummed when it ended, cause he thought we were going to keep doing it every week and I wanted to, but I had to go away for various things. Not only that, but there were all these times I was going to be able to see Ween and I wanted to see him at Red Rocks and he said, “Well you can jam, you can jam, just show up!” and I just couldn’t make it, you know. AD: What’s the vibe of the shed? Kurt Vile: I mean, he is a true rock and roller. You go there and you’re like partying. I just tell him any song I want to play. We did some originals and some covers. I can’t say what they are, but he is just stoked [and] he will learn it really quick, and we will add all this stuff. You just listen to him talk, talk about Ween, like he’s just a musical genius. His guitar playing, yeah I don’t know. My head is about to explode just thinking about it. AD: When did you first get into Ween? 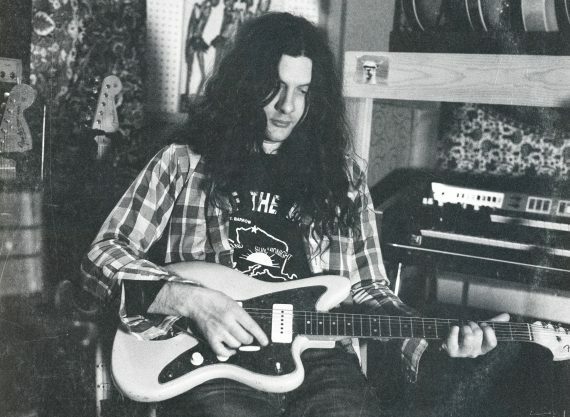 Kurt Vile: As a teen, you know…I liked “Voodoo Lady” on the radio. I would hear them in passing and then when The Mollusk just came out [some] friends came home drunk — I was staying at someone’s house and two people that live there came home drunk — and they just had seen Ween at the Trocadero in Philly, it was for The Mollusk and then they played the album and I was definitely stoned and a teenager and it blew my mind. [I’ve been] a super fan ever since. I still think “Mutilated Lips” is my favorite song maybe ever. AD: I always felt like they were a misunderstood band. Like people think they are a joke band. AD: So when might we hear some of that? Kurt Vile: I have no idea, but I want to jam with him again this winter. It’s crazy, things are getting crazy having to go on tour for this record. I have the family. I feel like we are a winter band, that’s my theory now, because that’s when I will have some time maybe. Last time we did it, it was last winter and it was freezing. You go up there, freezing your balls off, and you go into this little shed and make psychedelic classic rock. AD: The dream…So you have a six-year-old and an eight-year-old. Do they come with you when you’re recording? When you’re touring? Kurt Vile: They have, but if it’s best to come at the end of a tour. For instance, when I played Australia this year, my oldest, it [was] her birthday so they’ll come out to the sort of middle end of Australia and then hang around you know while I play a few shows around Australia. Then we will hang there afterward. AD: Did you guys get to do some sightseeing? Some fun stuff? Kurt Vile: Yeah! They met me on the south island of New Zealand actually, and then we just drove all around the south island. It was unreal. We were driving on the other side of the earth, it was surreal you know, beautiful. Then we went back to Australia and yeah hung around there. Melbourne and Tasmania. AD: You’ve got a lot of guests on this [record]. Mary Lattimore, who we mentioned before, Lucius, Kim Gordon from Sonic Youth. When did you first hear of Sonic Youth? Kurt Vile: I probably heard them on the radio a little, but mainly when I first heard Sonic Youth was at Lollapalooza the year they headlined. That’s when Washing Machine was the new album which honestly at the time, maybe the sound was bad or I just didn’t get them yet…I liked them but it sounded pretty crazy and noisy. I was just a teenager, I was far away, I just didn’t know their music, and then it hit me a little later. You know, you would see that Dirty album, it looked so cool. Well, all the ’90s CDs, looked pretty cool. I miss that era. A lot of those are my favorite record covers: Beck, Mellow Gold, or Sonic Youth, Dirty, Washing Machine. It’s like pop art, like a little absurd. AD: What was it like working with Kim? Kurt Vile: She’s my friend. It was cool, it was just very casual. I saw her at a show the day before, Steve Gunn was playing, she just asked if I needed some feedback so I was like sure. But she’s amazing. AD: In terms of when you’re in the process of songwriting, are you, do you enjoy the collaboration aspect of it or do you like to kind of have things half or more formed before you bring them to the table? Kurt Vile: I like to like leave things open, especially for someone like Kim, she was working on a very specific kind of feedback I feel like. She was like, “Let me know if you want some acoustic guitar feedback.” It was like whatever style she was working on lately, a certain pedal, a certain guitar. And then to have somebody like that to come in the room and be like, “Here you go!” At first, she played on this one song that didn’t make the album, but then she played on the outro of the song “Mutinies” as well. It’s just cool to watch it happen. Fall right into place. I like to collaborate with all kinds of people and just see what they’re going to do, and then take it from there. Then you either give suggestions or something doesn’t happen, you just have to show up to see what will happen in general. AD: I feel like this one really connects with your songwriting heroes. Willie Nelson, John Prine, Waylon Jennings — you can kind of hear that in all the songs. In terms of you when you were starting out, were you trying to connect and merge this traditional songwriting material to the kind of longer, spacier kind of things you do? Kurt Vile: I think it’s been even evolution or whatever. I always liked long songs. [To tie] back in Sonic Youth…the song they ended with at Lollapalooza was “The Diamond Sea,” and not long after I got the album, then it all clicked. AD: It’s about 25 minutes long. Kurt Vile: Yeah! I was into “White Light/White Heat” by the Velvet Underground at a kind of early age…“Sister Ray,” all those long songs. I grew up kind of subliminally [attracted to] the old-time music that my dad played. I have always sort of connected to the acoustic thing. The songwriter, fingerpicking thing. Somewhere along the way, they always kind of keep merging…[combining] that with noise or weirdness or whatever or not…it expands or contracts, you know? AD: Do you feel like artists like Neil Young or the Dead provided a road map of sorts connecting those styles? Kurt Vile: Well definitely Neil Young, and the Grateful Dead for sure…I respect the Dead, but I would say I learned lots from Neil Young. All throughout time, there’s always somebody exploring new territories, you know? AD: You and Courtney Barnett worked last year on Lotta Sea Lice. What did recording with her teach you? What did you take out of the experience? Kurt Vile: I mean it was awesome. She is such a great singer, [it was] very inspiring to be with her. We bounced off each other real quick. I think we were both inspired to have this project. [At first] we did a couple of songs; we didn’t know each other that well, we didn’t know [what] the project was going to be, [but] then the next Australian summer/American winter, that’s when it really clicked. We knew we were going to do some kind of release, maybe an EP, who knows, but things just really clicked and we made a lot of songs together. It just really clicked more than either of us would have imagined. It inspired us both. [We made] it so quick. You feel like a lot of people did that in the old days you know, [they] had to make the records fast. Some modern version of that scenario happened and then we just became the best friends on top of it all…we just became like brother and sister. LOVE LOVE LOVE the new album. Kurt is such a musical genius. New album is tasty like a fried krimpet washed down with a yards brawler. Would love to see Kurt on tour with Ween. Saw him play with Courtney at Union Transfer, wish I had a record of those solos.